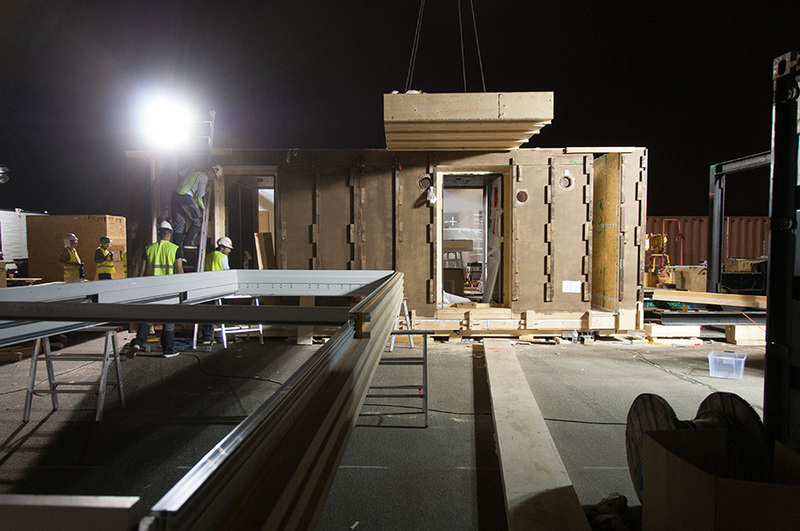 The Solar Decathlon takes ten days and it consists of ten different contests. In each contest, a maximum of one hundred points can be gained. The scoring, however, works differently in different categories. There are five “measured categories”: In the comfort zone contest, the teams have to keep the temperature and humidity in their houses steady. In the hot water contest, the teams have to show that their house generates more than enough hot water to take a nice shower: 56.8 liters of hot water have to be produced within ten minutes. For the appliances contest, sensors monitor constantly, whether refrigerator, freezer, dishwasher, the washing machine and the dryer work the way they should. Over the course of the competition, every house has to produce more electrical energy than it uses to gain the full score in the energy balance contest. A home is not really a home if you cannot invite your friends over. That is why there is also the home entertainment competition. The teams have to hold dinner parties and a movie night for a group of guests. Some important criteria cannot be defined by numbers. Five of the Solar Decathlon contests are decided by a jury: In the architecture contest, points are awarded for the quality of the design, a jury of professional engineers will evaluate the technology used in the houses in the engineering competition. Another jury will assess the market appeal of the building: Each team had to define target groups for their house. Points will be awarded if the jury thinks that the house is marketable and appeals to the target group. In the affordability contest, a jury will estimate the total cost of the house. It should be $250,000 or less to get a full score. The communications contest assesses how well the project is presented. This includes the on-site tours through the house, but also the website and printed material. The measured contests have already started: Several sensors pick up data around the clock. The decisive phase of the contest, however, will be the announcement of the scores awarded by the juries on Oct. 10 and Oct. 11. The points from each category are added up – and then, some points may be subtracted, for instance for not having completed the building in time. Team Austria was in fact one of the few teams which managed to complete their building in the allowed nine day period.